Price categories allow you to define several selling prices for your products for different customer types. You can also specify other info like accounting codes, sales tax, and/or document layout. For example, you can manage a specific price for individuals, another for companies, and another for export. 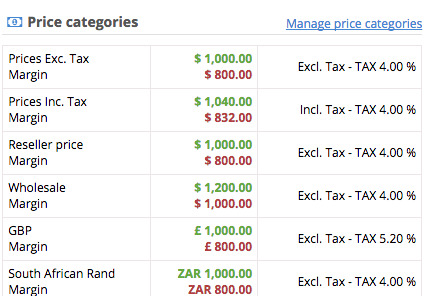 Each price category can use ATI (all taxes included) or ET (excluding taxes) prices, a fixed sales tax, an accounting code, and a layout depending on the client type. By default, your account has two categories - one ATI and one ET. To add a price category, click Settings > Catalog > Pricing & tax. The next page displays the existing categories. To add a price category, click the Add button. 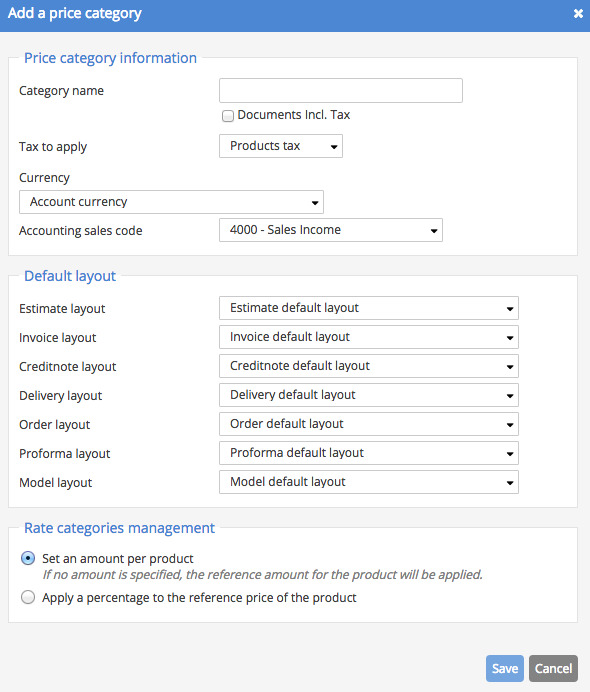 Identify and select the pricing type of your category and click Save. Please note that if you choose to apply a percentage, the discounted price will automatically be created in your catalog for every products and/or services. Your price category becomes available in your product pages where you can update prices.